Nancy Dell’Olio is not the type of woman who does things by half. When she found out that the Strictly Come Dancing final was to be held in Blackpool, the lawyer made sure she was prepared for the trip up north. Having never been to the home of Britain’s Pleasure Beach before, she took extra care to ensure that she was protected against the harsh seaside winds. The 50-year-old decided to double her pleasure and wore not one but two fur items to walk from her front door to a chauffeur driven Rolls-Royce. To be fair to Nancy it can get quite cold when walking around 10 metres from your home to a luxury car. The former girlfriend of Sven-Goran Eriksson opted to wear only her dark brown fur top to make the trip to Farnborough Airport where she would board a private plane to Blackpool. She carried her long light brown fur coat on one arm and accessorised the outfit with what looked like a crocodile skin handbag. The large brown handbag matched her top but clashed with her suede boots. It wasn’t until the feisty Italian-American arrived at the airport that she decided to put on her long fur coat. As she doubled up the amount of animal skin on her back she stood and read a newspaper while she waited to board the private jet. Property developer Nick Candy provided the luxurious transport for Nancy after she threatened to waltz out of the final when told she would have to travel from London to Blackpool on a coach chartered by the BBC. In the end she made the journey in the manner to which she has become accustomed – by private jet and chauffeur-driven Rolls-Royce – all thanks to Holly Valance’s millionaire boyfriend. She demanded a helicopter, but was told the budget wouldn’t stretch that far. 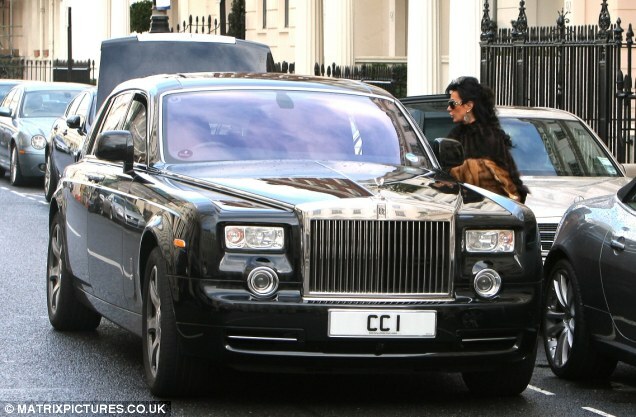 But cost seems to have been less of an issue for Mr Candy, who sent a Rolls-Royce, complete with personalised CC1 number-plates, to collect Ms Dell’Olio from her home and whisk her to Farnborough Airport in Hampshire. From there she joined fellow Strictly stars Brendan Cole, Ola and James Jordan and, of course, Miss Valance for the 70-minute flight north. Alex Jones’s boyfriend, a City banker known only as Charlie, joined them on the Hawker jet – while the One Show presenter herself took the coach up the M6, along with fellow contestants including Robbie Savage and Lulu. Despite their luxury journey, Miss Valance was happy to ‘slum it’ with her Strictly co-stars, taking a £122-a-night room at the four-star Big Blue hotel in Blackpool, which had been block-booked by the BBC.